*The clearing width is 680 mm/26.8inc. Two types of engines (6.3 ps and 8 ps) are available. 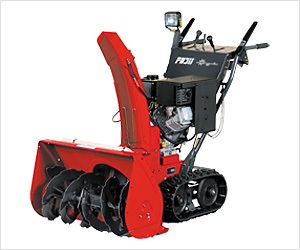 *The auger height can be adjusted with a foot pedal. *Snow throw direction and distance can be set by moving the steering wheel and levers. *The engine is started by stater motor (SA708MX1) and recoil starter (SA706MX1). *SA708MX1 has headlamps equipped as standard equipment. *Figures in parentheses for clearing height apply when the optional extension auger housing or auger housing guard is mounted. *The dimension with the deflector folded down is the actual measurement.